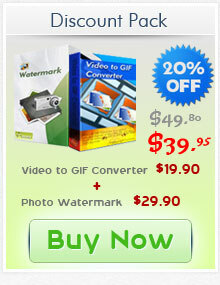 Our AVI to GIF is a shareware, the price is $19.90. But now, you can get AVI to GIF Converter for free, don’t lose the chance. Get fully licensed AVI to GIF software free! With our partnership TrialPay, you can try or buy products that you already need from hundreds of name brand retailers and they will pay for you. This TrialPay offer is currently only available for customers in the following countries: Australia, Austria, Belgium, Canada, Denmark, Finland, France, Germany, Greece, Iceland, Ireland, Italy, Liechtenstein, Luxembourg, Monaco, Netherlands, New Zealand, Norway, Portugal, Spain, Sweden, Switzerland, United Kingdom and the United States. How to get the AVI to GIF converter free? It's so easy, just click to the button to step by step Get Video to GIF Converter Free. Step5: Click "Run" button to convert avi to gif.